If I’m being honest the Kaby Lake launch at the start of the year was a bit of a damp squid. I’m aware that’s not the traditional phrasing, but the Intel Core i7 7700K bears more relation to a soggy cephalopod than it does a firecracker. 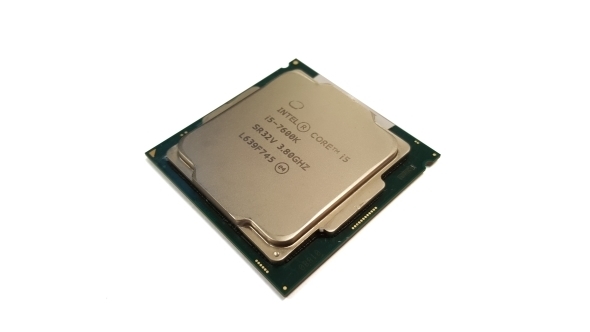 As ever though, for us gamers, it’s the cheaper Core i5 which is arguably more interesting and the i5 7600K right now is looking like the go-to Kaby Lake chip for gaming. A good solid state drive can make a big difference to your machine’s performance, so check out our guide to the best SSDs for gaming. I rarely give a pair of fetid dingo’s kidneys about a new Core i7 unless it’s got more cores in it than a boozy West Country cider. And so it came to pass with the Kaby Lake Core i7 – it was a frickin’ yawn-fest. 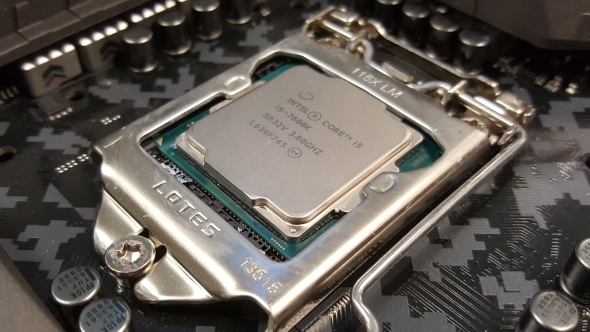 A CPU generation’s K-series i5 however is still able to deliver almost identical levels of gaming performance but for a significantly reduced price. And the same is true here, with the 7600K at $229 (£215) being over $100 cheaper than the 7700K. Click on the jump links below to get to your favourite techie bits quick. As it’s a Core i5 processor the big difference between it and the i7 is its lack of HyperThreading. 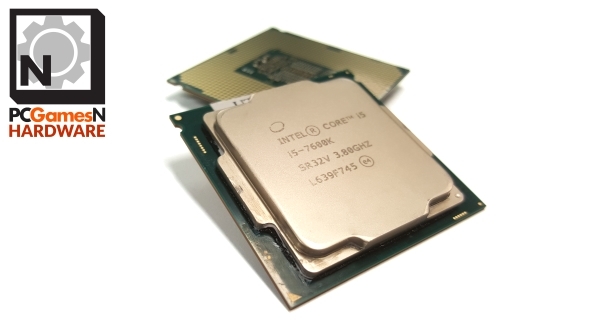 Intel’s HyperThreading allows a single CPU core to process two threads simultaneously, giving it greater multithreaded grunt than it would normally possess. That means, while the Core i7 7700K is able to effectively operate with eight virtual cores, the Core i5 7600K has to make do with only four actual cores. If you’re doing a lot of CPU-intensive media work, such as image manipulation or video/3D rendering, those extra processing threads make a huge amount of difference, but when you’re talking about gaming, not so much. We may be living in a world where games consoles have many, many (admittedly rubbish) CPU cores but still our games benefit most from having really good single-threaded throughput. 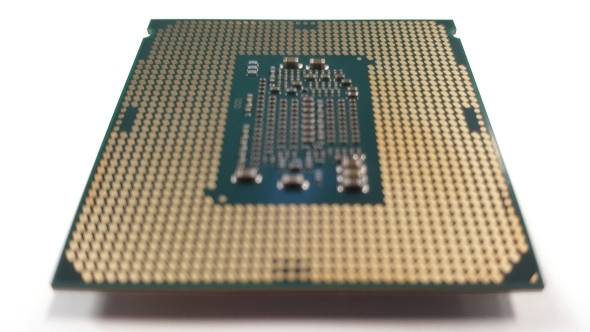 That’s why AMD’s previous processor architecture foundered so badly – Bulldozer hedged its bets on a multithreaded future which still hasn’t quite happened – and why Intel still rules the roost in terms of the best CPUs for gaming. Elsewhere it’s much the same story as with the previous generation’s i5. It’s still rocking a 91W TDP, 6MB of cache and the same socket and memory compatibility configuration. As it’s a Kaby Lake chip though it does come with the new media engine inside it, which means you can now stream 4K content from Netflix to your PC. If you get the upgraded Netflix sub, have a 4K monitor and remember to use the Edge browser. The Edge browser. The one Windows keeps telling you to use. No, it’s not Internet Explorer. Well, it kind of is. Anyway, it’s the only one that’s allowed to talk to Netflix’s 4K catalogue, so just use it for that and don’t blame us. Inevitably the straight CPU performance of the Core i5 7600K is off the pace compared with the much more expensive, eight-threaded i7 7700K, but because of its relatively high out-of-the-box clockspeed it’s mighty close in terms of single-threaded grunt. That higher clockspeed also means it’s got the jump on its i5 6600K predecessor. Those single-threaded performance numbers here are key when you shift focus to the gaming performance of the 7600K. Because the i5 performs so closely to the i7 when it’s prioritising a single thread the gaming frame rate difference is, to all intents and purposes, invisible. Even in the CPU-aware DX12 and Vulkan APIs it’s difficult to discern any variation in gaming performance. The synthetic Time Spy DirectX 12 benchmark does though highlight the disparity on the CPU side, with the i5 7600K showing a much lower CPU score than the i7 7700K. Maybe when games are built from the ground up for DX12 the differences will become more stark in frame rate terms, but until then why would you, as a gamer, need an i7? There are, however, obvious differences when it comes to the relative storage performance of the two CPUs. When plumbed into the system’s PCIe bus the sequential speeds are almost identical, but when you look at the random write performance there is a drop-off with the i5. The Core i5 7600K is also a touch slower in terms of compressing and unpacking a mixed media folder. If you want to pick up the basics of overclocking check out our guide on how to overclock your CPU. Where things get more exciting is in the overclocking stakes. This is more like it. This is what we were hoping for from the 14nm+ lithography of Kaby Lake. Without the HyperThreading of the i7 7700K our Core i5 7600K blasted past the 5GHz mark with ease. Our sample ran all the way up to a rock-solid 5.1GHz, only tapping out when we pushed it up towards 5.2GHz – and even then it was still booting. Looking at the 5.1GHz Time Spy benchmark you can see the differences between the two Kaby Lake K-series chips really shrink down. That is though all at the expense of the thermals. Realistically you’re not going to want your expensive silicon to be running at 99°C for long… That’s where features like the Overclocking Temperature Control in the Asus TUF Z270 Mark 1 motherboard really comes into its own. The Kaby Lake generation isn’t going to set the world alight the way some of Intel’s previous chips have done. Rather than Process>Architecture>Optimisation it’s seeming a little more like Process>Architecture>Flog horse. The tertiary optimisation phase of Intel’s CPU release cadence is more about consolidation than anything else; certainly not innovation. But the Core i5 7600K still has more about it than the superbly uninspiring i7 7700K. The price is right, the gaming performance is there and it’s able to overclock like a champ. Sure, if you’re sitting on an i5 from any of the last couple of generations you’re not going to gain much from making the upgrade switch, but if you’re starting from scratch then the i5 7600K is great place to build from. You can bet there are going to be some impressive pre-overclocked full rigs released with the 7600K at their hearts. The caveat here though is that if you are starting from scratch then there is a very good case to be made for picking one of the latest AMD Ryzen CPUs. The fantastic AMD Ryzen 5 1600X in particular is the biggest challeng to Intel’s Core i5 range and one of the driving forces behind the next-gen Coffee Lake range offering a six-core i5 processor for the first time. The 1600X comes with three times the thread-count of the 7600K and all for the same price. In terms of gaming performance the speedy single-threaded chops of the Intel chip gives it the win, but only ever by a small margin. With the price being so close you’re sacrificing a very small amount of legacy gaming performance for a huge uptick in multi-threaded prowess. 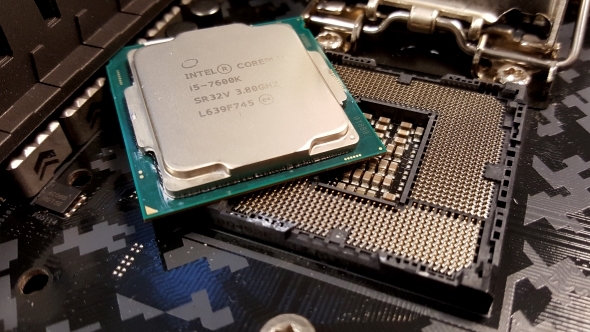 For pure gaming performance the Intel chip still has the win, so if all you’re ever going to do is single-thread-heavy gaming then the overclocked i5 is a great option to form the beating heart of your next PC build. But so many of us use our PC for a great many other things, and with the future of PC gaming assuredly being multi-threaded, it might prove to be a short-sighted choice.